This article is about the passenger railway service linking the United Kingdom, France, Belgium and the Netherlands. For other uses, see Eurostar (disambiguation). Until 2010, Eurostar was operated jointly by the national railway companies of France and Belgium, SNCF and SNCB/NMBS, and Eurostar (UK) Ltd (EUKL), a subsidiary of London and Continental Railways (LCR), which also owned the high-speed infrastructure and stations on the British side. Eurostar has become the dominant operator on the routes that it operates, carrying more passengers than all airlines combined. Other operators have expressed an interest in starting competing services following deregulation in 2010. On 1 September 2010, Eurostar was incorporated as a single corporate entity called Eurostar International Limited (EIL), replacing the joint operation between EUKL, SNCF and SNCB/NMBS. EIL is owned by SNCF (55%), Caisse de dépôt et placement du Québec (CDPQ) (30%), Hermes Infrastructure (10%) and NMBS (5%). In June 2014, the UK shareholding in Eurostar International Limited was transferred from London and Continental Railways / Department for Transport to HM Treasury. That October, it was announced that the UK government planned to raise £300 million by selling that stake. In March 2015, the UK government announced that it would be selling its 40% share to an Anglo-Canadian consortium made up of Caisse de dépôt et placement du Québec and Hermes Infrastructure. This sale was completed in May 2015. A typical Channel Tunnel cross section. A service tunnel lies in between the twin rail tunnels. The history of Eurostar can be traced to the 1986 choice of a rail tunnel to provide a cross-channel link between Britain and France. A previous attempt to construct a tunnel between the two nations had begun in 1974, but was quickly aborted. Construction began on a new basis in 1988. Eurotunnel was created to manage and own the tunnel, which was finished in 1993, the official opening taking place in May 1994. In addition to the tunnel's shuttle trains carrying cars and lorries between Folkestone and Calais, the decision to build a railway tunnel opened up the possibility of through passenger and freight train services between places further afield. British Rail and SNCF contracted with Eurotunnel to use half the tunnel's capacity for this purpose. In 1987, Britain, France and Belgium set up an International Project Group to specify a train to provide an international high-speed passenger service through the tunnel. France had been operating high-speed TGV services since 1981, and had begun construction of a new high-speed line between Paris and the Channel Tunnel, LGV Nord; French TGV technology was chosen as the basis for the new trains. An order for 30 trainsets, to be manufactured in France but with some British and Belgian components, was placed in December 1989. On 20 June 1993, the first Eurostar test train travelled through the tunnel to the UK. Various technical difficulties in running the new trains on British tracks were quickly overcome. On 14 November 1994, Eurostar services began between Waterloo International station in London, Gare du Nord in Paris and Brussels-South railway station in Brussels. The train service started with a limited Discovery service; the full daily service started from 28 May 1995. In 1995, Eurostar was achieving an average end-to-end speed of 171.5 km/h (106.6 mph) between London and Paris. On 8 January 1996, Eurostar launched services from a second UK railway station when Ashford International was opened. On 23 September 2003, passenger services began running on the first completed section of High Speed 1. Following a high-profile glamorous opening ceremony and a large advertising campaign, on 14 November 2007, Eurostar services in London transferred from Waterloo to the extended and extensively refurbished St Pancras International. Eurostar relocated from Waterloo International station to St Pancras International station in 2007. The Channel Tunnel used by Eurostar services holds the record for having the longest undersea section anywhere in the world, and it is the second-longest rail tunnel in the world. On 30 July 2003, a Eurostar train set a new British speed record of 334.7 km/h (208.0 mph) on the first section of the "High Speed 1" railway between the Channel Tunnel, and Fawkham Junction in north Kent two months before official services began running. On 16 May 2006, Eurostar set a new record for the longest non-stop high-speed journey, a distance of 1,421 kilometres (883 mi) from London to Cannes taking 7 hours 25 minutes. On 4 September 2007, a record-breaking train left Paris Gare du Nord at 10:44 (09:44 BST) and reached London St Pancras in 2 hours 3 minutes 39 seconds; carrying journalists and railway workers. This record trip was also the first passenger-carrying arrival to the new St Pancras International station. On 20 September 2007, Eurostar broke another record when it completed the journey from Brussels to London in 1 hour, 43 minutes. The original proposals for Eurostar included direct services to Paris and Brussels from cities north of London (NoL): Manchester via Birmingham on the West Coast Main Line and on the East Coast Main Line Leeds and Glasgow via Edinburgh, Newcastle and York. Seven shorter "NoL" Eurostar trains for these Regional Eurostar services were built, but these services never ran. Predicted journey times of almost nine hours for Glasgow to Paris at the time of growth of low-cost air travel during the 1990s made the plans commercially unviable against the cheaper and quicker airlines. Other reasons that have been suggested for these services having never been run were both government policies and the disruptive privatisation of British Rail. Three of the Regional Eurostar units were leased by Great North Eastern Railway (GNER) to increase domestic services from London King's Cross to York and later Leeds. The leases ended in December 2005, and most of the NoL sets have since been transferred to SNCF for TGV services in northern France. An international Nightstar sleeper train was also planned; this would have travelled the same routes as Regional Eurostar, plus the Great Western Main Line to Cardiff. These were also deemed commercially unviable, and the scheme was abandoned with no services ever operated. In 2000, the coaches were sold to Via Rail in Canada. Ashford International station was the original station for Eurostar services in Kent. Once Ebbsfleet International railway station, also designed to serve the Kent region, had opened, only three trains a day to Paris and one to Disneyland Paris called at Ashford for a considerable amount of time. There were fears that services at Ashford International might be further reduced or withdrawn altogether as Eurostar planned to make Ebbsfleet the new regional hub instead. However, after a period during which no Brussels trains served the station, to the dissatisfaction of the local communities, Eurostar re-introduced a single daily Ashford-Brussels service on 23 February 2009. In 2015, Eurostar threatened to require that cyclists dismantle bicycles before they could be transported on trains. Following criticism from Boris Johnson and cycling groups, Eurostar reversed the edict. By March 2016, onboard entertainment was provided by GoMedia, including Wi-Fi connectivity and up to 300 hours of movies and television kept on the train's servers and accessed using the passenger's own devices: mobile phones, tablets etc. A tracker app allows customers to see where they are. LGV Nord is a French 333-kilometre (207 mi)-long high-speed rail line that connects Paris to the Belgian border and the Channel Tunnel via Lille. It opened in 1993. Its extensions to Belgium and towards Paris, as well as connecting to the Channel Tunnel, have made LGV Nord a part of every Eurostar journey undertaken. A Belgian high-speed line, HSL 1, was added to the end of LGV Nord, at the Belgian border, in 1997. Of all French high-speed lines, LGV Nord sees the widest variety of high-speed rolling stock and is quite busy; a proposed cut-off bypassing Lille, which would reduce Eurostar journey times to Paris, is called LGV Picardie. The Channel Tunnel is a crucial part of the route as it is the only rail connection between Great Britain and the European mainland. It joins LGV Nord in France with High Speed One in Britain. Tunnelling began in 1988, and the 50.5-kilometre (31.4 mi) tunnel was officially opened by British sovereign Queen Elizabeth II and the French President François Mitterrand at a ceremony in Calais on 6 May 1994. It is owned by Getlink, which charges a significant toll to Eurostar for its use. In 1996, the American Society of Civil Engineers named the tunnel as one of the Seven Wonders of the Modern World. Along the current route of the Eurostar service, line speeds are 300 kilometres per hour (186 mph) except within the Channel Tunnel, where a reduced speed of 160 kilometres per hour (100 mph) applies for safety reasons. Since the launch of Eurostar services, severe disruptions and cancellations have been caused by fires breaking out within the Channel Tunnel, such as in 1996, 2006 (minor), 2008 and 2015. Until the opening on 2 June 1996, of the first phase of the Belgian high speed line, Eurostar trains were routed via the Belgian railway line 94. The Eurostar routes still use the line as a diversion if engineering works are taking place on HSL1, depending where it is. The 06:13 from London St Pancras to Brussels still uses the line as a diversion to bypass the peak time disruptions on HSL1 due to the extra TGV services from Brussels for the commuters. After 2 June 1996, some Eurostars to Brussels were routed via the first phase of the Belgian High Speed line and the Belgian railway line 78 via Mons. Although this line is still as a diversion if HSL1 is doing engineering, also depending where the maintenance is taking place. Journey times between London and Brussels were improved when an 88-kilometre (55 mi) Belgian high-speed line, HSL 1, opened on 14 December 1997. It links with LGV Nord on the border with France, allowing Eurostar trains heading to Brussels to make the transition between the two without having to reduce speed. A further four-minute improvement for London–Brussels trains was achieved in December 2006, with the opening of the 435-metre (1,427 ft) Brussels South Viaduct. Linking the international platforms of Brussels-South railway station with the high-speed line, the viaduct separates Eurostar (and Thalys) from local services. High Speed 1 (HS1), formerly known as the Channel Tunnel Rail Link (CTRL), is a 108-kilometre (67 mi) high-speed railway line running from London through Kent to the British end of the Channel Tunnel. It was built in two stages. The first section between the tunnel and Fawkham Junction in north Kent opened in September 2003, cutting London–Paris journey times by 21 minutes to 2 hours 35 minutes, and London–Brussels to 2 hours 20 minutes. On 14 November 2007, commercial services began over the whole of the new HS1 line. 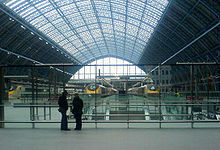 The redeveloped St Pancras International station became the new London terminus for all Eurostar services. 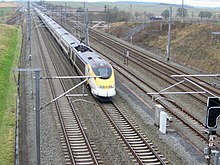 The completion of High Speed 1 has brought the British part of Eurostar's route up to the same standards as the French and Belgian high-speed lines. Non-stop journey times were reduced by a further 20 minutes to 2 hours 15 minutes for London–Paris and 1 hour 51 minutes for London–Brussels. Eurostar offers up to sixteen weekday London – Paris services (eighteen on Fridays) including ten non-stop (twelve on Fridays). Previously there were ten London–Lille and Brussels services, including five running non-stop as far as Lille, but this has now been reduced to seven each way. In addition, there is a return trip from London to Marne-la-Vallée - Chessy for Disneyland Paris, which runs at least 4 times a week with increased frequency during school holidays, and an up-to-5-times-a-week service to Marseille via Lyon and Avignon. There are also seasonal services in the winter. "Snow trains", aimed at skiers, to Bourg-Saint-Maurice, Aime-la-Plagne and Moûtiers in the Alps; these run twice-weekly, one overnight and one during the daytime. Intermediate stations are Ebbsfleet International in northwest Kent, Ashford International in southeast Kent, and Calais-Fréthun and Lille-Europe in Nord-Pas-de-Calais. In February 2018, Eurostar announced the start of its long planned service from London to Amsterdam, with an initial two trains per day from April of that year running between St Pancras and Amsterdam Centraal. This launched as a one-way service, with return trains carrying passengers to Rotterdam and Brussels Midi/Zuid, making a 28-minute stop (which has not been deemed long enough to process UK-bound passengers) and then carrying different passengers from Brussels to London. Passengers travelling back must take Thalys services to Brussels Midi/Zuid where they can join the Eurostar. This is owing to the lack of UK Border Force facilities at Amsterdam Centraal and Rotterdam Centraal. Since 14 November 2007, all Eurostar trains have been routed via High Speed 1 to or from the redeveloped London terminus at St Pancras International, which at a cost of £800 million was extensively rebuilt and extended to cope with 394-metre (431 yd) long Eurostar trains. It had originally been intended to retain some Eurostar services at Waterloo International, but this was ruled out on cost grounds. Completion of High Speed 1 has increased the potential number of trains serving London. Separation of Eurostar from British domestic services through Kent meant that timetabling was no longer affected by peak-hour restrictions. Eurostar's fares were significantly higher in its early years; the cheapest fare in 1994 was £99 return. In 2002, Eurostar was planning cheaper fares, an example of which was an offer of £50 day returns from London to Paris or Brussels. By March 2003, the cheapest fare from the UK was £59 return, available all year around. In June 2009 it was announced that one-way single fares would be available at £31 at the cheapest. Competition between Eurostar and airline services was a large factor in ticket prices being reduced from the initial levels. Business Premier fares also slightly undercut air fares on similar routes, targeted at regular business travellers. In 2009, Eurostar greatly increased its budget ticket availability to help maintain and grow its dominant market share. The Eurostar ticketing system is very complex, being distributed through no fewer than 48 individual sales systems. Eurostar is a member of the Amadeus CRS distribution system, making its tickets available alongside those of airlines worldwide. First class on Eurostar is called Business Premier; benefits include guaranteed faster checking-in and meals served at-seat, as well as the improved furnishings and interior of Business Premier carriages. The rebranding is part of Eurostar's marketing drive to attract more business professionals. Increasingly, business people in a group have been chartering private carriages as opposed to individual seats on the train. Two Eurostar trains, a Thalys train, and a TGV train side by side at Paris Gare du Nord. Without the operation of Regional Eurostar services using the North of London trainsets across the rest of Britain, Eurostar has developed its connections with other transport services instead, such as integrating effectively with traditional UK rail operators' schedules and routes, making it possible for passengers to use Eurostar as a quick connection to further destinations on the continent. All three main terminals used by the Eurostar service – St Pancras International, Paris Gare du Nord, and Brussels Midi/Zuid – are served by domestic trains and by local urban transport networks such as the London Underground and the Paris Metro. Standard Eurostar tickets no longer include free onward connections to or from any other station in Belgium: this is now available for a flat-rate supplement, currently £5.50. Eurostar has announced several partnerships with other rail services, most notably Thalys connections at Lille and Brussels for passengers to go beyond current Eurostar routes towards the Netherlands and Germany. 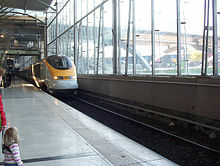 In 2002, Eurostar initiated the Eurostar-Plus program, offering connecting tickets for onward journeys from Lille and Paris to dozens of destinations in France. Through fares are also available from 68 British towns and cities to destinations in France and Belgium. In May 2009 Eurostar announced that a formal connection to Switzerland had been established in a partnership between Eurostar and Lyria, which will operate TGV services from Lille to the Swiss Alps for Eurostar connection. Entering the UK in Paris (left) and France in London using the Eurostar. Because the UK is not part of the Schengen Area, and because Belgium and France are not part of the Common Travel Area, all Eurostar passengers must go through border controls. 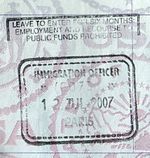 Both the British Government and the Schengen governments concerned (Belgium and France) have legal obligations to check the travel documents of those entering their respective countries (as well as those leaving, in the case of Belgium and France). To allow passengers to walk off the train without arrival checks in most cases, juxtaposed controls ordinarily take place at the embarkation station. In order to comply with special UK legislation, there are full security checks similar to those at airports, scanning both bags and people's pockets. Security checks at Eurostar are comparable to those at a small airport and generally much quicker than at London Heathrow. The recommended check-in time is 30 minutes except for business class where it is 10 minutes. 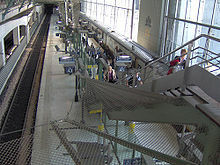 Eurostar passengers travelling inside the Schengen Area (Brussels–Lille, Brussels–Calais and Amsterdam/Rotterdam—Brussels; Lille–Calais trips are not allowed to be performed by Eurostar) pass through a separate corridor in Brussels bypassing border checks, and enter the preallocated cars of the train, which is reserved for these passengers. This arrangement was set up after numerous illegal immigrants entered the UK without the right to do so, by buying a ticket from Brussels to Lille or Calais but remaining on the train until London – an issue exacerbated by Belgian police threatening to arrest UK Border Agency staff at Brussels-Midi if they tried to prevent passengers whom they suspected of attempting to exploit this loophole from boarding Eurostar trains. When the tripartite agreements were signed, the Belgian Government said that it had serious questions about the compatibility of this agreement with the Schengen Convention and the principle of free movement of people enshrined in various European Treaties. On 30 June 2009 Eurostar raised concerns at the UK House of Commons Home Affairs Select Committee that it was illegal under French law for the collection of information desired by the UK government under the e-Borders scheme, and they would be unable to cooperate. On the northbound Marne la Vallée-Chessy - London train, the security check and French passport check take place at Marne la Vallée-Chessy, while the UK passport check takes place at the UK arrival stations - this is the only route where passengers are not cleared by UK border officials before crossing the channel. On the northbound Marseille-London train, there is no facility for security or passport checks at the southern French stations, so passengers must leave the train at Lille-Europe, taking all their belongings with them, and undergo security and border checks there before rejoining the train which waits at the station for just over an hour. On several occasions, people have illegally tried to stow away on board the train, sometimes in large groups, trying to enter the UK; border monitoring and security is therefore extremely tight. Eurostar claims to have good and well-funded security measures. Eurostar market share and punctuality. Eurostar's punctuality has fluctuated from year to year, but usually remains over 90%; in the first quarter of 1999, 89% of services operated were on time, and in the second quarter it reached 92%. Eurostar's best punctuality record was 97.35%, between 16 and 22 August 2004. In 2006, it was 92.7%, and in 2007, 91.5% were on time. In the first quarter of 2009, 96% of Eurostar services were punctual, compared with rival air routes' 76%. 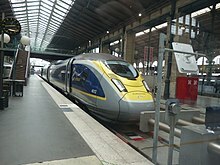 An advantage held by Eurostar is the convenience and speed of the service: with shorter check-in times than at most airports and hence quicker boarding and less queueing and high punctuality, it takes less time to travel between central London and central Paris by high-speed rail than by air. Eurostar now has a dominant share of the combined rail–air market on its routes to Paris and Brussels. In 2004, it had a 66% share of the London–Paris market, and a 59% share of the London–Brussels market. In 2007, it achieved record market shares of 71% for London–Paris and 65% for London–Brussels routes. Eurostar's passenger numbers initially failed to meet predictions. In 1996, London and Continental Railways forecast that passenger numbers would reach 21.4 million annually by 2004, but only 7.3 million was achieved. 82 million passengers used Waterloo International Station from its opening in 1994 to its closure in 2007. 2008 was a record year for Eurostar, with a 10.3% rise in passenger use, which was attributed to the use of High Speed 1 and the move to St Pancras. The following year, Eurostar saw an 11.5% fall in passenger numbers during the first three months of 2009, attributed to the 2008 Channel Tunnel fire and the 2009 recession. As a result of the poor economic conditions, Eurostar received state aid in May 2009 to cancel out some of the accumulated debt from the High Speed 1 construction programme. Later that year, during snowy conditions in the run-up to Christmas, thousands of passengers were left stranded as several trains broke down and many more were cancelled. In an independent review commissioned by Eurostar, the company came in for serious criticism about its handling of the incident and lack of plans for such a scenario. In 2006, the Department for Transport predicted that, by 2037, annual cross-channel passenger numbers would probably reach 16 million, considerably less optimistic than London and Continental Railways's original 1996 forecast. In 2007 Eurostar set a target of carrying 10 million passengers by 2010. The company cited several factors to support this objective, such as improved journey times, punctuality and station facilities. Passengers in general, it stated, are becoming increasingly aware of the environmental effects of air travel, and Eurostar services emit much less carbon dioxide. and that its remaining carbon emissions are now offset, making its services carbon neutral. Further expansion of the high-speed rail network in Europe, such as the HSL-Zuid line between Belgium and the Netherlands, continues to bring more destinations within rail-competitive range, giving Eurostar the possibility of opening up new services in future. In June 2003, Eurostar was battling to recover from the worst period in its 10-year history. Negative media coverage combined with poor sales and the general public's low opinion of the British rail industry, created a major challenge... Eurostar was finding it difficult to pick itself up from one of the worst periods in its decade-long history. The period post 9/11 had sent the business into a downturn. Passenger numbers were drying up due to worries over international travel. Several management changes had led to a pause in strategy. Punctuality had suffered badly because of wider problems with the UK's rail infrastructure. By 2008, Eurostar's environmental credentials had become highly developed and promoted. In 2006 Eurostar's Environment Group was set up, with the aim of making changes in the Eurostar services' daily running to decrease the environmental impact, the organisation setting itself a target of reducing carbon emissions per passenger journey by 25% by 2012. Drivers are trained in techniques to achieve maximum energy efficiency, and lighting has been minimised; the provider of the bulk of the energy for the Channel Tunnel has been switched to nuclear power stations in France. Eurostar's current target is to reduce emissions by 35 percent per passenger journey by 2012, putting itself beyond the efforts of other railway companies in this field and thereby winning the 2007 Network Rail Efficiency Award. In the grand opening ceremony of St Pancras International, one of the Eurostar trains was given the name 'Tread Lightly', said to symbolise their smaller impact on the environment compared to planes. Since 2010, Eurostar is owned by Eurostar International Limited, a company jointly owned by SNCF (55%), Caisse de dépôt et placement du Québec (CDPQ) (30%), Hermes Infrastructure (10%) and SNCB (5%). Eurostar is a member of Railteam, a marketing alliance formed in July 2007 of seven European high-speed rail operators. The alliance plans to allow tickets to be booked from one end of Europe to the other on a single website. In June 2009 London and Continental Railways, and the Eurostar UK operations they held ownership of, became fully nationalised by the UK government. In addition to its multiple unit fleet units, Eurostar operates a single Class 08 diesel shunter as the pilot at Temple Mills depot. 31 "Inter-Capital" sets consisting of two power cars and eighteen passenger carriages. These trains are 394 metres (1,293 ft) long and can carry 750 passengers: 206 in first class, 544 in standard class. 7 shorter "North of London" sets which have two power cars and fourteen passenger carriages and are 320 metres (1,050 ft) long. These sets have a capacity of 558 seats: 114 first class, 444 standard and which were designed to operate the aborted Regional Eurostar services. The trains are essentially modified TGV sets, and can operate at up to 300 kilometres per hour (186 mph) on high-speed lines, and 160 kilometres per hour (99 mph) in the Channel Tunnel. It is possible to exceed the 300-kilometre-per-hour speed limit, but only with special permission from the safety authorities in the respective country. Speed limits in the Channel Tunnel are dictated by air-resistance, energy (heat) dissipation and the need to fit in with other, slower trains. The trains were designed with Channel Tunnel safety in mind, and consist of two independent "half-sets" each with its own power car. In the event of a serious fire on board while travelling through the tunnel, passengers would be transferred into the undamaged half of the train, which would then be detached and driven out of the tunnel to safety. If the undamaged part were the rear half of the train, this would be driven by the Chef du Train, who is a fully authorised driver and occupies the rear driving cab while the train travels through the tunnel for this purpose. As 27 of the 31 Inter-Capital sets are sufficient to operate the service, four are currently used by SNCF for domestic TGV services; one of these regularly operates a Paris–Lille shuttle. The Eurostar logos have been removed from these sets, but the base colours of white, black, and yellow remain. SNCF's lease of the sets is scheduled to last until 2011[needs update], with an option for a further two years. In 2004–2005 the "Inter-Capital" sets still in daily use for international services were refurbished with a new interior designed by Philippe Starck. The original grey-yellow scheme in Standard class and grey-red of First/Premium First were replaced with a grey-brown look in Standard and grey-burnt-orange in First class. Power points were added to seats in First class and coaches 5 and 14 in Standard class. Premium First class was renamed BusinessPremier. In 2008, Eurostar announced that it would be carrying out a mid-life refurbishment of its Class 373 trains to allow the fleet to remain in service beyond 2020. This will include the 28 units making up the Eurostar fleet, but not the three Class 373/1 units used by SNCF or the seven Class 373/2 "North of London" sets. As part of the refurbishment, the Italian company Pininfarina was contracted to redesign the interiors, and The Yard Creative was selected to design the new buffet cars. On 11 May 2009 Eurostar revealed the new look for its first-class compartments. The first refurbished train was due in service in 2012, and Eurostar plans to have completed the entire process by 2014. On 13 November 2014 Eurostar announced the first refurbished trains would not re-enter the fleet until the 3rd or 4th quarter of 2015 due to delays at the completion centre. In addition to the announced mid-life update of the existing Class 373 fleet, Eurostar in 2009 reportedly entered prequalification bids for eight new trainsets to be purchased. Any new trains would need to meet the same safety rules governing passage through the Channel Tunnel as the existing Class 373 fleet. The replacement to the Class 373 trains has been decided jointly between the French Transport Ministry and the UK Department for Transport. The new trains will be equipped to use the new ERTMS in-cab signalling system, due to be fitted to High Speed 1 around 2040. Class 374 at Gare du Nord in Paris. On 7 October 2010, it was reported that Eurostar had selected Siemens as preferred bidder to supply 10 Siemens Velaro e320 trainsets at a cost of €600 million (and a total investment of more than £700 million with the refurbishment of the existing fleet included) to operate an expanded route network, including services from London to Cologne and Amsterdam. These would be sixteen-car, 400-metre (1,312 ft) long trainsets built to meet current Channel Tunnel regulations. The top speed will be 320 km/h (199 mph) and they will have 894–950 seats, unlike the current fleet built by the French company Alstom, which has a top speed of 300 km/h (186 mph) and a seating capacity of 750. Total traction power will be rated at 16 MW. On 13 November 2014 Eurostar announced the purchase of an additional seven e320s for delivery in the second half of 2016. At the same time, Eurostar announced the first five e320s from the original order of ten would be available by December 2015, with the remaining five entering service by May 2016. Of the five sets ready by December 2015, three of them were planned to be used on London-Paris and London-Brussels routes. Diesel locomotive 90 145 12 Intended to operate sleeper services over non-electrified parts of the railway network in Britain. Eurostar retained three locomotives for the rescue of failed trains, route learning and driver training, but sold them to Direct Rail Services when the new Temple Mills Depot opened in November 2007. Electro-diesel locomotive 90 145 2 Were used primarily to rescue failed trains. Eurostar operated two of these from its North Pole depot until 2007, when they were loaned to a pair of educational initiatives having become redundant following the move to Temple Mills. Electric locomotive 87 140 7 Intended to operate the Nightstar sleeper services. Eurostar owned seven units of this class, which never saw service until they were sold in 2007 to Europorte 2. 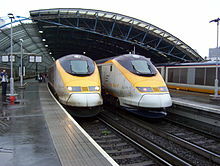 In 2005, the chief executive of Eurostar, Richard Brown, suggested that existing Eurostar trains could be replaced by double-deck trains similar to the TGV Duplex units when they are withdrawn from service. According to Brown, a double-deck fleet could carry 40 million passengers per year from Britain to Continental Europe, equivalent to adding an extra runway at a London airport. A number of technical incidents have affected Eurostar services over the years, but up to the present[update] there has only been one major accident involving a service operated by Eurostar, a derailment in June 2000. Other incidents in the Channel Tunnel — such as the 1996 and 2008 Channel Tunnel fires — have affected Eurostar services but were not directly related to Eurostar's operations. However, the breakdowns in the tunnel, which resulted in cessation of service and inconvenience to thousands of passengers, in the run-up to Christmas 2009, proved a public-relations disaster. There have been several minor incidents with a few Eurostar services. In October 1994 there were teething problems relating to the start of operations. The first preview train, carrying 400 members of the press and media, was delayed for two hours by technical problems. On 29 May 2002 a Eurostar train was initially sent down a wrong line — towards London Victoria railway station instead of London Waterloo — causing the service to arrive 25 minutes late. A signalling error that led to the incorrect routeing was stated to have caused "no risk" as a result. On 11 April 2006, a house collapsed next to a railway line near London which caused Eurostar services to have to terminate and start from Ashford International instead of London Waterloo. Passengers waiting at Waterloo International were initially directed on to local trains towards Ashford leaving from the adjacent London Waterloo East railway station, until overcrowding occurred at Ashford. Approximately 1000 passengers were trapped in darkness for several hours inside two Eurostar trains on the night of 19/20 February 1996. The trains stopped inside the tunnels due to electronic failures caused by snow and ice. Questions were raised at the time about the ability of the train and tunnel electronics to withstand the mix of snow, salt and ice which collect in the tunnels during periods of extreme cold. On 5 June 2000 a Eurostar train travelling from Paris to London derailed on the LGV Nord high-speed line while traveling at 290 km/h (180 mph). Fourteen people were treated for light injuries or shock, with no fatalities or major injuries. The articulated nature of the trainset was credited with maintaining stability during the incident and all of the train stayed upright. The incident was caused by a traction link on the second bogie of the front power car coming loose, leading to components of the transmission system on that bogie impacting the track. 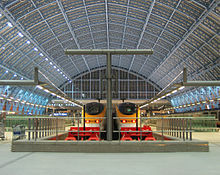 The first departures from St Pancras on 14 November 2007 coincided with an open-ended strike by French rail unions as part of general strike actions over proposed public-sector pension reforms. The trains were operated by uninvolved British employees and service was not interrupted. On 23 September 2009 an overhead power line dropped on to a Class 373 train arriving at St Pancras station, activating a circuit breaker and delaying eleven other trains. Two days later, on 25 September 2009, electrical power via the overhead lines was lost on a section of high-speed line outside Lille, delaying passengers on two evening Eurostar-operated services. During the December 2009 European snowfall, four Eurostar trains broke down inside the Channel Tunnel, after leaving France, and one in Kent on 18 December. Although the trains had been winterised, the systems had not coped with the conditions. Over 2,000 passengers were stuck inside failed trains inside the tunnel, and over 75,000 had their services disrupted. All Eurostar services were cancelled from Saturday 19 December to Monday 21 December 2009. An independent review, published on 12 February 2010, was critical of the contingency plans in place for assisting passengers stranded by the delays, calling them "insufficient". On 7 January 2010 a Brussels-London train broke down in the Channel Tunnel, resulting in three other trains failing to complete their journeys. The cause of the failure was the onboard signalling system. Due to the severe weather, a limited service was operated in the next few days. On 15 February 2010, services between Brussels and London were interrupted following the Halle train collision, this time after the dedicated HSL 1 lines in the suburbs of the Belgian capital were blocked by debris from a serious train crash on the suburban commuter lines alongside. No efforts were made to reroute trains around the blockage; Eurostar instead terminated services to Brussels at Lille, directing passengers to continue their journey on local trains. Brussels services resumed on a limited scale on 22 February. On 21 February 2010 the 21:43 service from Paris to London broke down just outside Ashford International, stranding 740 passengers for several hours while a rescue train was called in. On 15 April 2010 air traffic in Western Europe closed because of the eruption of the Eyjafjallajökull volcano. Many travellers between the UK and the European mainland instead took the Eurostar train, all tickets between Brussels and London on 15 and 16 April being sold out within 3½ hours after the closure of British airspace. Between 15 and 20 April, Eurostar put on 33 additional trains and carried 165,000 passengers – 50,000 more than had been scheduled to travel during this period. On 17 October 2011 a man fell at approximately 17:40 or 17:50 from the 17:04 service from London to Brussels as it passed through Westenhanger and Cheriton in Folkestone, near the entry to the Channel Tunnel. The individual was an Albanian who had been refused entry to the United Kingdom and was voluntarily returning to Brussels. The line was handed back at 22:09 after being closed for several hours following the incident. The train itself returned north to Ashford International, where passengers were transferred to a Eurostar service operating from Marne-la-Vallée to London, where passengers arrived again at approximately 22:30. Eurostar trains do not currently call at Stratford International, originally intended to be the London stop for the regional Eurostars. This was to be reviewed following the 2012 Olympics. However, in 2013, Eurostar claimed that its 'business would be hit' by stopping trains there. Although the original plan for Regional Eurostar services to destinations north of London was abandoned, the significantly improved journey times available since the opening of High Speed 1 — which is physically connected to both the East Coast Main Line and the North London Line (for the West Coast Main Line) at St Pancras — and the recently increased maximum speeds on the West Coast Main Line may make potential Regional Eurostar services more commercially viable. This would be even more likely if proposals are adopted for a new high-speed line from London to the north of Britain. Simon Montague, Eurostar's Director of Communications, commented that: "...International services to the regions are only likely once High Speed 2 is built." However, as of 2014 the current plans for High Speed 2 do not allow for a direct rail link between that new line, and High Speed 1, meaning passengers would still be required to change at Euston and take some form of transportation to St Pancras International. Key pieces of infrastructure still belong to LCR via its subsidiary London & Continental Stations and Property, such as the Manchester International Depot, and Eurostar (UK) still owns several track access rights and the rights to paths on both the East Coast and West Coast Main Lines. While no announcement has been made of plans to start Regional Eurostar services, it remains a possibility for the future. In the meantime, the closest equivalent to Regional Eurostar services are same-station connections with East Midlands Trains and Thameslink, changing at St Pancras. The recent construction of a new concourse at adjacent King's Cross Station has improved interchange with St Pancras and provided London North Eastern Railway, Great Northern, Hull Trains and Grand Central services with easier connections to Eurostar. Eurostar has already been involved in reviewing and publishing reports into High Speed 2 for the British Government and looks favourably upon such an undertaking. The operation of Regional Eurostar services will not be considered until such time as High Speed 2 has been completed. Alternatively, future loans of the North of London sets to other operators would enable the trains to operate at their full speed, unlike GNER's previous loan between 2000 and 2005, where the trains were limited to 175 km/h (109 mph) on regular track. A separate company called High Speed Two (HS2) Ltd has been set up to investigate the feasibility and viability of a new line likely serving a similar route to the West Coast Main Line. LGV Picardie is a proposed high-speed line between Paris and Calais via Amiens. By cutting off the corner of the LGV Nord at Lille, it would enable Eurostar trains to save 20 minutes on the journey between Paris and Calais, bringing the London–Paris journey time under 2 hours. In 2008 the French Government announced its future investment plans for new LGVs to be built up to 2020; LGV Picardie was not included but was listed as planned in the longer term. "We know we can go to most places in France physically, because our trains are compatible with French infrastructure, but then you've got to look at impact on fleet utilisation, you've got to have a station that's got the spare capacity to have a train stood for a number of hours, for all the security, screening, passport control passes. So it's not possible to go just anywhere. And you've got to be able to get the control authorities to agree that there's a big enough market for it to be worthwhile for them to set up there." Richard Brown, Chief Executive of Eurostar. The reduced journey times offered by the opening of High Speed 1 and the opening of the LGV Est and HSL-Zuid bring more continental destinations within a range from London where rail is competitive with air travel. By Eurostar's estimates a train would then take 3 hours 30 minutes from London to Amsterdam. At present Eurostar is concentrating on developing its connections with other services, but direct services to other destinations would be possible. With the new e320 rolling stock allowed Eurostar to enter the Netherlands and possibly Germany in future. In additional with every new country Eurostar enters there are security issues, due to the UK's not having signed up to the Schengen Agreement, which allows unrestricted movement across borders of member countries. For example on the current Amsterdam to London route it is only direct one way with people needing to get a train to Brussels to go through UK passport control. With the direct connection subjects to talks between the UK and Dutch governments set to be compete in 2020 for services to start. The difficulties that Eurostar faces in expanding its services would also be faced by any potential competitors to Eurostar. As the UK is outside the Schengen Agreement, London-bound trains must use platforms that are physically isolated, a constraint which other international operators such as Thalys do not face. In addition, the British authorities are required to make passenger security and passport checks before they board the train, which might deter domestic passengers. Compounding the difficulties in providing a similar service are the Channel Tunnel safety rules, the major ones being the "half-train rule" and the "length rule". The "half-train rule" stipulated that passenger trains had to be able to split in the case of emergency. Class 373 trains were designed as two half-sets, which when coupled form a complete train, enabling them to be split easily in the event of an emergency while in the tunnel, with the unaffected set able to be driven out. The half-train rule was finally abolished in May 2010. However, the "length rule", which states that passenger trains must be at least 375 metres long with a through corridor (to match the distance between the safety doors in the tunnel), was retained, preventing any potential operators from applying to run services with existing fleets (the majority of both TGV and ICE trains are only 200m long). 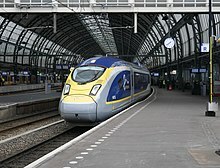 At the same time as Pepy's announcement, Richard Brown announced that Eurostar's plans for expanding its network potentially included Amsterdam and Rotterdam as destinations, using the HSL Zuid line. This would require either equipment upgrades of the existing fleet, or a new fleet equipped for both ERTMS and the domestic signalling systems used by Nederlandse Spoorwegen. Following the December 2009 opening of HSL Zuid, a London–Amsterdam journey is estimated to take 4 hr 16 min. In an interview with Eurostar's Chief Executive Nicolas Petrovic in the Financial Times in May 2012, an intention for Eurostar to serve ten new destinations was expressed, including Amsterdam, Frankfurt, Cologne, Lyon, Marseille and Geneva, along with a likely second hub to be created in Brussels. In March 2016 in an interview with Bloomberg, Eurostar's Chief Executive expressed interest in operating a direct train service between London and Bordeaux, but not before 2019. Journey time was said to be around four and a half hours using the new LGV Sud Europe Atlantique. In December 2012 Eurostar announced that on Saturdays during May 2013–June 2013 a new seasonal service would be introduced to Aix-en-Provence, also serving Lyon Part-Dieu and Avignon TGV on the way (the latter being 6 kilometres (4 miles) from central Avignon). This is in addition to the long-standing seasonal summer service on Saturdays during July and August and the first week of September travelling to Avignon Centre. The Aix-en-Provence services did not run in 2014 but was replaced along with the seasonal Avignon Centre services with the new year-round service to Lyon and Marseille as of 1 May 2015. In 2018, at least, direct services to Lyon, Avignon and Marseille ran only from May to September, with connections during the rest of the year being offered via Eurostar but requiring a change to SNCF trains in Paris or Lille. Travel time from London to Marseille was roughly 6.5 hours in 2018. In September 2013, Eurostar announced an agreement with the Government of Netherlands and NS, the Dutch railway company to start twice daily services between London and Amsterdam Centraal; the launch was initially planned for December 2016. The service will use the newly bought Siemens Velaro trainsets and will also call at Brussels, and Rotterdam. The journey time will be around four hours. Initially, trains stop in Brussels for about half an hour to allow domestic passengers from Amsterdam and Rotterdam to leave and allow London bound passengers to board. Eventually, Passengers for London from Amsterdam and Rotterdam will undertake all security checks before boarding and will be able to travel direct both ways. The trains will also convey passengers from the Netherlands on journeys to Brussels who will not need to pass through security and they will be allocated half the train which will be kept separate from the London-bound passengers by locking the intermediate door. The Brussels-bound half of the train will be security swept on arrival at Brussels before Brussels-to-London passengers can board. The journey from London to Amsterdam Centraal will take 3 hr 41 min and trains will call at Brussels Zuid/Midi and Rotterdam Centraal Station. From Amsterdam Centraal to London St Pancras, trains will take 4 hr 9 min to include the 28 minute stop at Brussels. Eurostar trains from London will also call at Antwerp Centraal and Schiphol Airport, although trains from Amsterdam will miss out Antwerp on the journey back to London. In November 2014, Eurostar announced the service to Amsterdam would start in "2016-2017", and would include a stop at Schiphol Airport in addition to the previously announced destinations. Eurostar have indicated that the calling pattern 'is not set in stone' and if a business case supports it the service might be extended to additional cities such as Utrecht. The service was finally planned to start running on 4 April 2018, with fare prices starting at £35 for a single ticket. An "inaugural train" from St Pancras International to Amsterdam via Rotterdam broke a speed record for the journey to Brussels (1hr 46mins) on 20 February 2018. The first regular service to Amsterdam left St Pancras at 08:31 on 4 April 2018. In 2010, international rail travel was liberalised by new European Union directives, designed to break up monopolies in order to encourage competition for services between countries. This sparked interest among other companies in providing services in competition to Eurostar and new services to destinations beyond Paris and Brussels. The only rail carrier to formally propose and secure permission for such a service up to now is Deutsche Bahn, which intends to run services between London and Germany and the Netherlands. The sale of High Speed One by the British Government having effectively nationalised LCR in June 2009 is also likely to stimulate competition on the line. In March 2010, it was announced that Eurotunnel was in discussions with the Intergovernment Commission, which oversees the tunnel, with the aim of amending elements of the safety code governing the tunnel's usage. Most saliently, the requirement that trains be able to split within the tunnel and each part of the train be driven out to opposite ends has been removed. However, the proposal to allow shorter trains was not passed. Eurotunnel Chairman & Chief Executive Jacques Gounon said that he hoped the liberalisation of rules would allow entry into the market of competitors such as Deutsche Bahn. Sources at Eurotunnel suggested that Deutsche Bahn could have entered the market at the timetable change in December 2012. This, however, did not happen. In July 2010 Deutsche Bahn (DB) announced that it intended to make a test run with a high-speed ICE-3MF train through the Channel Tunnel in October 2010 in preparation for possible future operations. The trial ran on 19 October 2010 with a Class 406 ICE train specially liveried with a British "Union flag" decal. The train was then put on display for the press at St Pancras International. However, this is not the class of train that would be used for the proposed service. At the St Pancras ceremony, DB revealed that it planned to operate from London to Frankfurt and Amsterdam (two of the biggest air travel markets in Europe), with trains 'splitting & joining' in Brussels. It hoped to begin these services in 2013 using Class 407 ICE units, with three trains per day each way—morning, midday and afternoon. Initially the only calling points would be Rotterdam on the way to Amsterdam, and Cologne on the way to Frankfurt. Amsterdam and Cologne would be under four hours from London, Frankfurt around five hours. DB decided to put this on hold mainly due to advance passport check requirements. DB had hoped that immigration checks could be done on board, but British authorities required immigration and security checks to be done at Lille Europe station, taking at least 30 minutes. Cumulative ridership since 1994 has reached 190 million, 11 million passengers had used its international services during 2018, the highest ever, a 7% increase on the 10·3 million carried in 2017. ^ "Eurostar Timetable : 27 MAY 2018 - 8 DECEMBER 2018" (PDF). Content-static.eurostar.com. Retrieved 7 January 2019. ^ "Eurostar confirms plans for senior management changes". Breaking Travel News. 20 August 2009. ^ a b "Behind the scenes - Eurostar". Eurostar.com. ^ a b "Hermes secures Eurostar ownership for pension funds after UK sell-off". Realestate.jpe.com. ^ "House of Commons Hansard Ministerial Statements for 19 Jun 2014 (pt 0001)". UK Parliament. House of Commons. Retrieved 3 October 2014. ^ "Eurostar rail stake touted for sale by UK government". BBC News. Retrieved 14 August 2016. ^ Noulton, John (February 2001). "The Channel Tunnel" (PDF). Japan Railway & Transport Review (26): 38–45. Archived from the original (PDF) on 10 April 2009. Retrieved 10 May 2009. ^ a b "On this day: 6 May 1994: President and Queen open Chunnel (with video clip)". BBC News. 6 May 1994. Retrieved 12 January 2008. ^ a b "Our history". Eurotunnel. Archived from the original on 23 November 2010. Retrieved 10 May 2009. ^ a b c d e "Our history". Eurostar. Archived from the original on 29 October 2009. Retrieved 1 September 2009. ^ a b Wolmar, Christian (21 October 1994). "Channel train opens with a breakdown". The Independent. London. Retrieved 10 May 2009. ^ a b c "Official Waterloo 'Goodbye' video, useful statistics and numbers shown". Youtube.com. 20 December 2007. Retrieved 27 April 2010. ^ "Waterloo International: 1994–2007". The Guardian. London. 13 November 2007. Retrieved 18 November 2007. ^ a b "Rail Chronology: Eurostar services". www.railchronology.free-online.co.uk. ^ Takagi, Ryo (March 2005). "High-speed Railways:The last ten years" (PDF). Japan Railway & Transport Review (40): 4–7. Archived from the original (PDF) on 20 June 2009. Retrieved 1 May 2009. ^ Carmichael, Sri; Low, Valentine (7 November 2007). "The royal pride of reborn St Pancras". London Evening Standard. Retrieved 7 April 2012. ^ Sweney, Mark (14 July 2007). "Eurostar launches St Pancras ads". The Guardian. London. Retrieved 7 May 2012. ^ a b Higham, Nick (6 November 2007). "The transformation of St Pancras". BBC News. Retrieved 14 December 2007. ^ Gilbert, Jane (1 December 2006). "'Chunnel' workers link France and Britain". The Daily Post. Rotorua, New Zealand: APN New Zealand. ^ Minus, Jodie (26 January 2007). "Eurostar an underground force". The Australian. Sydney. Retrieved 27 May 2009. ^ "Eurostar sets new Guinness World Record with cast and filmmakers of Columbia Pictures' The Da Vinci Code" (Press release). Eurostar. 17 June 2006. Retrieved 27 May 2009. ^ "Eurostar breaks UK high speed record" (Press release). Eurostar. 30 July 2003. ^ "Eurostar sets Paris-London record". BBC News. 4 September 2007. Retrieved 14 December 2007. ^ Williams, Michael (21 September 2007). "Eurostar puts Brussels within the 'two-hour club' after record rail journey". The Independent. London. ^ "Review of regional Eurostar services: summary report". Department for Transport. n.d. Archived from the original on 14 December 2010. ^ "Eurostar extension in doubt". BBC News. 28 April 1999. Retrieved 31 December 2007. ^ a b Knowles, Richard; Farrington, John (December 1998). "Why Has the Market Not Been Created for Channel Tunnel Regional Passenger Rail Services?". Area. Royal Geographical Society. 30 (4): 359–366. doi:10.1111/j.1475-4762.1998.tb00080.x. JSTOR 20003928. ^ "High-speed GNER trains scrapped". BBC News. 16 January 2002. Retrieved 10 May 2009. ^ a b "Channel Tunnel Rail Link (CTRL), United Kingdom". Railway-technology-com. n.d. Retrieved 11 May 2009. ^ Guerra, Michael (December 2003). "Second chance for Eurostar sleepers" (PDF). Railwatch (93). RailFuture. pp. 10–11. Archived from the original (PDF) on 20 June 2009. Retrieved 28 April 2009. ^ Hickling, Michael (1 November 2007). "Fast track to Europe – old track to Yorkshire". Yorkshire Post. Leeds. ^ "Official Ashford International information page". Eurostar. Archived from the original on 21 February 2009. Retrieved 8 May 2009. ^ "Save Ashford International". www.saveashfordinternational.org.uk. Archived from the original on 13 January 2008. Retrieved 18 February 2008. ^ "Ashford to become a 'ghost town'". Metro. 12 September 2006. ^ Harrison, Michael (12 September 2006). "Eurostar cutbacks deliver blow to Ashford". The Independent. London. ^ "Petition opposing Eurostar cuts". BBC News. 3 April 2007. Retrieved 6 August 2009. ^ "Town fears losing Eurostar trains". BBC News. 27 October 2006. Retrieved 4 January 2010. ^ "Ashford International to Brussels". Eurostar. Archived from the original on 30 January 2009. Retrieved 2 February 2009. ^ Hemsley, Andy. "Rye back on international rail map". Rye and Battle Observer. Retrieved 8 August 2008. ^ Julian Glover (16 March 2016). "Bring your own device to Eurostar entertainment". Retrieved 18 August 2016. ^ (in French) "Bilan LOTI de la LGV Nord Rapport" (PDF). Réseau Ferré de France. May 2005. Retrieved 10 May 2009. ^ O'Connell, Dominic (13 March 2008). "Fees for high-speed tunnel link derail Eurostar's gravy train". The Times. London. Archived from the original on 12 June 2011. Retrieved 25 May 2009. ^ Reynolds, Christopher (19 May 1996). "Seven Wonders of the World: The Modern List". The Plain Dealer. Cleveland, Ohio. ^ a b "Eurostar article". railfaneurope.net. 27 May 2001. Retrieved 28 April 2009. ^ a b c d "Eurotunnel Network Statement 2008" (PDF). Eurotunnel. 18 March 2008. Archived from the original (PDF) on 25 November 2008. Retrieved 7 April 2012. ^ Kirkland, C.J. (2002). "The fire in the Channel Tunnel" (PDF). Tunnelling and Underground Space Technology. 17 (2): 129–132. doi:10.1016/S0886-7798(02)00014-7. Archived from the original (PDF) on 20 September 2010. ^ "Lorry fire closes Channel Tunnel". BBC News. 21 August 2006. Retrieved 7 April 2012. ^ a b "Tunnel fire eats into Eurostar's passenger numbers". Kent Online. Maidstone. 16 April 2009. Retrieved 18 April 2009. ^ "Infrabel celebrates 10 years of the High Speed Line in Belgium" (Press release). Brussels: Infrabel. 14 December 2007. Archived from the original (DOC) on 3 March 2016. ^ "New £7.5 million railway viaduct at Brussels Midi station further enhances Eurostar reliability on the London–Brussels route" (Press release). Eurostar. Archived from the original on 7 June 2011. Retrieved 16 April 2009. ^ "High Speed 1, United Kingdom". railway-technology.com. Retrieved 11 May 2009. ^ "The need for a Channel Tunnel Rail Link". Department for Transport. Archived from the original on 13 June 2008. Retrieved 10 May 2009. ^ a b "Eurostar arrives in Paris on time". BBC News. 14 November 2007. Retrieved 14 December 2007. ^ a b "With the new Eurostar high speed rail link, Alstom participates in the European rail network" (Press release). Alstom. 7 November 2007. ^ Rudd, Matt (28 October 2007). "Eurostar to Brussels". The Times. London. Retrieved 10 May 2009. ^ "Eurostar Service from 9 December 2012 to 1 June 2013" (PDF). Eurostar. Archived from the original (PDF) on 16 March 2012. Retrieved 22 December 2012. ^ "Destinations". Eurostar. Archived from the original on 27 June 2009. Retrieved 15 May 2009. ^ "Disneyland by Eurostar- Travel Empire". Retrieved 16 October 2012. ^ "Eurostar Snow Train". Eurostar website. Archived from the original on 10 December 2012. Retrieved 16 October 2012. ^ "Eurostar winter ski tickets". thisfrenchlife.com. Retrieved 11 May 2009. ^ "Eurostar's other UK stations". Eurostar. Archived from the original on 25 September 2009. Retrieved 11 May 2009. ^ "Direct Eurostar from London to Amsterdam - Starts 4 April 2018 - Timetable, fares, tickets". www.seat61.com. ^ Dyckhoff, Tom (24 July 2007). "St Pancras regains the Gothic glamour". The Times. London. ^ Webster, Ben (14 November 2007). "Five Waterloo platforms left in limbo by Eurostar pullout". The Times. London. ^ a b Trend, Nick (29 October 2004). "The savvy traveller: Training makes a difference". The Daily Telegraph. London. Retrieved 14 May 2009. ^ a b Mungo, Paul (19 August 2002). "Why Eurostar has failed to make the grade". The Daily Mail. London. Retrieved 14 May 2009. ^ a b Mawer, Fred (12 September 2008). "The Crafty Traveller: At long last, Eurostar enters the singles market". The Daily Mail. London. Retrieved 30 June 2009. ^ Frary, Mark (12 September 2008). "Scramble for seats as Eurostar remains suspended". The Times. London. Retrieved 14 May 2009. ^ Martin, Andrew (18 November 2007). "St Pancras is a start, but it takes more to stop us flying". The Independent. London. Retrieved 14 May 2009. ^ Rodgers, Paul (17 May 1995). "6.57 office to Paris". The Independent. London. Retrieved 14 May 2009. ^ "Bon voyage". The Sun. London. 27 April 2009. Retrieved 28 April 2009. ^ Calder, Simon (20 October 2007). "The cost of the Eurostar train in Spain falls way below the plane". The Independent. London. Retrieved 14 May 2009. ^ "Eurostar available alongside airlines on the GDS systems" (Press release). Eurostar. 5 July 2006. Archived from the original on 2 December 2008. ^ "Eurostar – Classes of Travel – Business Premier". Rail Europe. Retrieved 14 May 2009. ^ "Eurostar means Business". Eurostar. Archived from the original on 12 March 2009. Retrieved 14 May 2009. ^ "Private train carriages 'become more popular'". laterooms.com. 12 June 2009. Archived from the original on 23 July 2012. Retrieved 21 January 2016. ^ "Through fares to the continent with Eurostar". National Rail. Archived from the original on 25 May 2009. Retrieved 13 May 2009. ^ Fender, Keith (December 2011). "Eurostar changes Belgian tickets and connections". Modern Railways. p. 82. ^ a b c "Eurostar unveils new rail alliance with European high-speed train operators, Thalys and Deutsche Bahn's ICE" (Press release). Eurostar. 5 April 2005. Archived from the original on 10 November 2006. 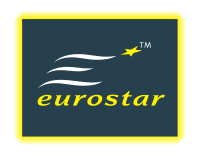 ^ "Through-fares from 68 UK towns and cities to continental Europe now available on eurostar.com" (Press release). Eurostar. 18 December 2007. Archived from the original on 29 May 2009. ^ "Eurostar Connecting to Switzerland". holidayhypermarket.co.uk. 28 May 2009. Archived from the original on 23 August 2011. Retrieved 28 May 2009. ^ Mycroft, Dave (29 May 2009). "New Eurostar Link Up Opens Easier, Cheaper Travel". outdoorsmagic.com. Archived from the original on 3 December 2009. Retrieved 2 June 2009. ^ "Take the ski train to the Swiss Alps". Eurostar. Archived from the original on 20 October 2012. Retrieved 16 October 2012. ^ a b "Q&A: Schengen Agreement". BBC News. 15 December 2008. Retrieved 26 April 2009. ^ "The Channel Tunnel (Security) Order 1994 (especially point 13)". Legislation.gov.uk. 20 March 2012. Retrieved 7 April 2012. ^ "What is Eurostar Security for?". Retrieved 23 September 2010. ^ Cox, Simon (8 December 2011). "UK border staff in arrest threat over 'Lille loophole'". Bbc.co.uk. ^ Ford, Richard (30 June 2009). "New British £750 million electronic border control plan 'breaks EU law'". The Times. London. Retrieved 30 June 2009. ^ Williams, Chris (30 June 2009). "Eurostar tunnels through UK border ring of steel". The Register. Retrieved 30 June 2009. ^ a b Dowd, Vincent (30 May 2015). "Direct train to Europe". BBC World Service. Archived from the original on 30 May 2015. Retrieved 30 May 2015. ^ Boffey, Daniel (25 April 2009). "Immigrant clings to roof of 186mph Eurostar". Daily Mail. London. Retrieved 26 April 2009. ^ Landesman, Peter (14 April 2002). "The Light at The End of the Chunnel". The New York Times. Retrieved 26 April 2009. ^ "Police find Eurostar stowaways". BBC News. 3 August 2001. Retrieved 26 April 2009. ^ "Safety and security: Border controls". Eurotunnel. Archived from the original on 25 November 2010. Retrieved 1 September 2009. ^ "Eurostar boosts passenger security at Ashford International" (Press release). Eurostar. 6 June 2007. Archived from the original on 29 October 2008. ^ "Rail travel you can rely on". Eurostar. Archived from the original on 29 July 2009. Retrieved 15 May 2009. ^ "The Company File: Eurostar trains beat planes". BBC News. 6 July 1999. Retrieved 2 May 2009. ^ "Eurostar achieves best ever punctuality performance" (Press release). Eurostar. 2 October 2006. Archived from the original on 28 December 2010. ^ Eurostar uses the airlines' definition of 'on-time': within 15 minutes of scheduled arrival time. The measure used for long-distance services in the UK rail industry is within 10 minutes. ^ "High Speed 1 delivers a record year for Eurostar" (Press release). Eurostar. 9 January 2008. Archived from the original on 29 May 2009. ^ Desiderio, Matthieu (16 April 2008). "Eurotunnel and Eurostar 2008 1Q results: positive!". Transport Expertise. Paris. Archived from the original on 20 February 2012. Retrieved 27 April 2009. ^ "Eurostar Booms Thanks to Airport Security". Air, Business and Travel News. London. 8 August 2006. Archived from the original on 19 April 2013. Retrieved 26 April 2009. ^ "10 Good Reasons to Travel Eurostar". Eurostar. Archived from the original on 31 August 2009. Retrieved 27 April 2009. ^ "Eurostar achieves record market share" (Press release). Eurostar. 14 September 2004. Archived from the original on 8 August 2009. ^ Wright, Robert (10 January 2008). "Eurostar passenger numbers surge". Financial Times. London. Retrieved 6 August 2009. ^ a b "Select Committee on Public Accounts Thirty-Eighth Report". House of Commons. 4 May 2006. Retrieved 15 December 2007. ^ "Eurostar sees record high in passengers". Daily Mail. London. 13 January 2009. Retrieved 28 April 2009. ^ Clark, Nick (15 April 2008). "Eurostar credits move to St Pancras for boosting ticket revenues by 25 per cent". The Independent. London. Retrieved 10 May 2009. ^ Lane, Michael (16 April 2009). "Eurostar suffers 5.8% fall in sales". Travel Trade Gazette. London. Archived from the original on 5 February 2013. Retrieved 29 April 2009. ^ Clark, Nicola (16 April 2009). "Eurostar hit by recession". Marketing Magazine. London. Retrieved 18 April 2009. ^ "EU approves British state aid for high-speed Eurostar line". EU Business. Richmond, Surrey. Agence France-Presse. 13 May 2009. Archived from the original on 5 June 2011. ^ Sturcke, James (12 February 2010). "Eurostar 'had no plan' to deal with train breakdown delays". The Guardian. London. ^ "Delivering a Sustainable Railway — White Paper. Part 8: International". London: Department for Transport. Archived from the original on 13 May 2010. Retrieved 1 September 2009. ^ "Channel Tunnel Traffic Forecasting". Transport Issues. Nottingham University. Retrieved 1 September 2009. ^ "Eurostar generates ten times less CO2 than flying the same routes". Eurostar. Archived from the original on 26 August 2009. Retrieved 1 September 2009. ^ "Eurostar plans 'greener' trains". BBC News. 17 April 2007. Retrieved 26 April 2009. ^ "Eurostar travel hits record level". BBC News. 13 January 2009. Retrieved 18 April 2009. ^ "Eurostar sales up in 2009 despite travel chaos". BBC News. 20 January 2010. Retrieved 22 January 2010. ^ "Eurostar sales rise on recovery in business travel". BBC News. 14 January 2011. Retrieved 14 January 2011. ^ "Eurostar sales boosted by visitors from outside EU". BBC News. 8 March 2012. Retrieved 27 April 2012. ^ "'Strong' 2012 for Eurostar". Rail.co. 25 March 2013. Archived from the original on 10 April 2013. Retrieved 25 March 2013. ^ "Eurostar passenger figures topped 10 million in 2013". BBC News. 5 March 2014. Retrieved 5 March 2014. ^ "Eurostar growth continues in 2014". Railwaygazette.com. 18 February 2015. Retrieved 19 February 2015. ^ "Eurostar passenger numbers steady but profit down". Railwaygazette.com. 15 March 2016. Retrieved 16 March 2016. ^ "Eurostar — A seamless journey to the continent" (PDF). Japan Railway & Transport Review. 40: 29–33. March 2005. Archived from the original (PDF) on 20 June 2009. Retrieved 1 May 2009. ^ Davidson, Max (14 November 2007). "Eurostar: welcome to the new age of trains". The Daily Telegraph. London. Retrieved 2 May 2009. ^ "Eurostar Company Awards page". Eurostar. Archived from the original on 28 May 2009. Retrieved 11 May 2009. ^ "Travel Awards 2008 winners". The Guardian. London. 12 October 2008. Retrieved 1 May 2009. ^ Charles, Paul (1 June 2005). "Rebuilding Eurostar's brand and reputation". Strategic Communication Management. Chicago & London. ISSN 1363-9064. Archived from the original on 25 February 2010. Retrieved 7 April 2012. ^ Grant, John (2008). The green marketing manifesto. Chichester, Sussex: John Wiley. p. 94. ISBN 0-470-72324-6. ^ a b "Winners of 2007". Network Rail. Archived from the original on 6 January 2009. Retrieved 7 April 2012. ^ a b Kanter, James (5 May 2009). "French Nuclear Power Cleans Up Eurostar". Green Inc. blog. The New York Times. Retrieved 8 May 2009. ^ Statement by Richard Brown, Chief Executive of Eurostar, during the opening ceremony, video clip on YouTube. ^ a b "A high-speed revolution". The Economist. London. 5 July 2007. Retrieved 17 July 2007. ^ Wilckens, Martin; Ellewanger, Gunther (October 1994). "High speed for Europe" (PDF). Japan Railway & Transport Review. Archived from the original (PDF) on 20 June 2009. Retrieved 1 May 2009. ^ "French Railway Industry: The paths of excellence" (PDF). DGE/UBIFRANCE. Archived from the original (PDF) on 6 January 2014. Retrieved 6 January 2014. ^ Nash, Emily (5 September 2007). "Eurostar sets new Paris-London record". The Mirror. London. Retrieved 21 May 2009. ^ a b Wolmar, Christian (23 November 2007). "Who is going to use the new high speed line?". Rail (579). Peterborough. Retrieved 11 May 2009. ^ "Eurostar to tender for refurbishment". RailNews. London. 8 September 2008. Retrieved 7 April 2012. 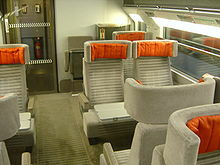 ^ "Eurostar refurbishment design contract awarded". Railway Gazette International. London. 8 April 2009. Archived from the original on 14 April 2012. Retrieved 9 April 2009. ^ "The Yard creates 'drastically different' Eurostar buffet cars". Design Week. London. 14 May 2009. ^ "Eurostar unveils new first class layout". Opodo Travel News. 11 May 2009. Archived from the original on 30 December 2013. Retrieved 7 April 2012. ^ Smithers, Rebecca (9 April 2009). "Eurostar interiors to get makeover by Italian luxury car designer". The Guardian. London. Retrieved 1 April 2010. ^ a b c UK, DVV Media. "Eurostar orders seven more e320s". Railwaygazette.com. Retrieved 14 August 2016. ^ "Eurostar considering larger fleet?". Railway Gazette International. London. 6 April 2009. Retrieved 18 April 2009. ^ "2017 start date for Great Western ERTMS upgrade". The National Union of Rail, Maritime & Transport workers (RMT). 9 October 2007. Archived from the original on 26 December 2007. Retrieved 8 September 2009. 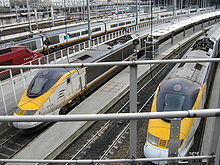 ^ a b "Eurostar picks Velaro to expand fleet". Railway Gazette International. London. 1 October 2010. Retrieved 2 October 2010. ^ "Siemens weathering economic storm as work begins on new Eurostar". International Railway Journal. London. 31 October 2011. Archived from the original on 19 March 2012. Retrieved 7 April 2012. ^ "Siemens Mobility References". Siemens. 2011. Archived from the original on 24 May 2012. Retrieved 7 April 2012. ^ Wright, Robert (1 October 2010). "Row breaks out over Eurostar train order". Financial Times. London. Retrieved 1 October 2010. ^ Wright, Robert (19 October 2010). "Alstom heads for court over Eurostar trains". Financial Times. London. ^ "Alstom fails to block Eurostar contract". International Railway Journal. London. 30 October 2010. Archived from the original on 1 November 2010. Retrieved 30 October 2010. ^ "Alstom lodges Eurostar complaint in Brussels". Financial Times. London. 4 November 2010. Retrieved 11 November 2010. ^ Wendlandt, Astrid (11 November 2010). "Alstom says Eurostar tender hearing in Oct 2011". Reuters. Retrieved 11 November 2010. ^ Milmo, Dan (15 July 2011). "Siemens keeps €600m Eurostar order after Alstom legal challenge fails". The Guardian. London. p. 29. Retrieved 15 August 2012. ^ Topham, Gwyn (3 April 2012). "Alstom drops Eurostar legal action after SNCF orders more trains". The Guardian. London. Retrieved 15 August 2012. ^ "Better by design: Eurostar's £700m facelift". railway-technology.com. 12 March 2012. Retrieved 23 September 2012. ^ Smithers, Rebecca; Topham, Gwyn (13 November 2014). "Eurostar launches e320 train with space for 900 passengers". The Guardian. Retrieved 21 July 2015. ^ "Eurostar Depot for Stratford". railwaypeople.com. 10 December 2004. Retrieved 28 April 2009. ^ "Eurostar loans a class 73 locomotive for South Wales regeneration initiative" (Press release). Eurostar. 20 June 2007. Archived from the original on 29 May 2009. ^ "Eurostar teams up with Railschool in East London to create training opportunities for young people" (Press release). Eurostar. 26 June 2007. Archived from the original on 29 May 2009. ^ "Development for Europorte 2: Eurotunnel buys five Class 92 locomotives" (Press release). Eurotunnel. 15 February 2007. ^ "Double decked trains could be replacement for Eurostars". Rail Magazine (529): 11. 21 December 2005. ^ Sturgess, Trevor (22 December 2009). "Eurostar faces up to bad press after PR disaster". Kent Messenger. Maidstone. Retrieved 25 December 2009. ^ "Rail delays after house caves in". BBC News. 11 April 2006. Retrieved 24 January 2010. ^ Wolmar, Christian (22 February 1996). "Wrong kind of snow in tunnel." The Independent. London. Retrieved 21 December 2009. ^ "Eurostar delayed by power fault". BBC News. 24 September 2009. Retrieved 26 September 2009. Eleven Eurostar services were delayed when a power line collapsed as a train pulled into St Pancras on Wednesday. ^ "Refunds after Eurostar breakdowns". BBC News. 26 September 2009. Retrieved 26 September 2009. Friday's 1932 BST service from London St Pancras to Paris and the 1934 BST to Brussels stopped outside Lille, north-east France, at around 2100 BST. ^ Gammell, Caroline (21 December 2009). "Eurostar launches independent review". The Daily Telegraph. London. ^ "Eurostar: "améliorer l'info dans le tunnel"". Le Figaro (in French). Paris. 21 December 2009. ^ Gabbatt, Adam; agencies (21 December 2009). "Eurostar services suspended for third day as bad weather hits flights". The Guardian. London. Retrieved 21 December 2009. ^ "Eurostar handling of snow delays criticised". BBC News. 12 February 2010. Retrieved 13 February 2010. ^ "Eurostar Independent Review". 12 February 2010. Archived from the original on 6 January 2014. Retrieved 6 January 2014. ^ "Eurostar disrupted after new breakdown in Channel tunnel". The Independent. London. 7 January 2010. Retrieved 1 April 2010. ^ "Eurostar Trains Turn Back From Channel Tunnel After Icing Up". Bloomberg. New York. 7 January 2010. Retrieved 6 January 2014. ^ "Stricken Eurostar train towed out of Channel Tunnel". Reuters. 7 January 2010. ^ "Catastrophe de Buizingen: un nouveau rapport critique la SNCB et Infrabel". RTBF (in French). Brussels. 5 May 2012. Retrieved 13 June 2012. ^ "Eurostar passengers stranded near Ashford". BBC News. 22 February 2010. Retrieved 1 April 2010. ^ "Eurostar naar Londen vandaag en morgen uitverkocht!". NS Hispeed Twitter (in Dutch). 15 April 2010. Retrieved 20 April 2010. ^ a b c "Albanian Falls To His Death From Eurostar". Sky News. 18 October 2011. Retrieved 25 August 2012. about 5.50pm on Monday. … "The man's body has been recovered to William Harvey Hospital in Ashford, Kent" he said. "The train was taken out of service and the line handed back at 10.09pm." ^ "Albanian man falls to death from Eurostar train in Kent". BBC News. 18 October 2011. Retrieved 18 October 2011. ^ Webster, Ben (21 April 2006). "Ghost train station that cost £210m". The Times. London. Retrieved 22 December 2007. ^ "Eurostar 'will not stop' at Stratford International". BBC News. 25 May 2010. Retrieved 25 May 2010. ^ "Boris Johnson urges Eurostar to start using Olympic Park station". Standard.co.uk. 29 July 2013. Retrieved 14 August 2016. ^ "Eurostar welcomes greengauge 21's call for high speed 2" (Press release). Eurostar. 20 June 2007. Archived from the original on 28 December 2010. ^ a b Montague, Simon (8 May 2009). "Rail investments that will last for 200 years" (Letter to the Editor). Yorkshire Post. Leeds. Retrieved 14 May 2009. ^ "HS2: Plans revived to connect London terminus of High Speed Two with". 11 July 2015. ^ "Train Access Rights necessary to operate additional passenger services on the East Coast Main Line" (PDF). Office of the Rail Regulator. 27 January 2006. Archived from the original (PDF) on 4 March 2009. Retrieved 26 April 2009. ^ "Consultation on capacity study for East Coast Main Line" (PDF). Railways Archive. 19 December 2005. Retrieved 26 April 2009. ^ Massey, Ray (14 March 2012). "New era for King's Cross station as futuristic £500million concourse is unveiled". Daily Mail. London. Retrieved 23 September 2012. ^ "Written committee submission by Eurostar" (PDF). The Scottish Parliament. 31 October 2008. Archived from the original (PDF) on 5 June 2011. Retrieved 2 May 2009. ^ "About HS2". High Speed Two (HS2) Ltd. Archived from the original on 14 March 2010. Retrieved 30 December 2009. ^ McGhie, Tom (6 August 2006). "£19bn plan for high-speed rail link". thisismoney.co.uk. Retrieved 2 May 2009. ^ "Long-term TGV plans". Railway Gazette International. London. 2 June 2008. Archived from the original on 17 December 2009. Retrieved 18 April 2009. ^ Silvester, Katie (February 2008). "Interview with Richard Brown, Chief Executive of Eurostar" (PDF). Rail Professional. Cambridge. Archived from the original (PDF) on 4 March 2009. Retrieved 31 December 2008. ^ "25 kV and BB21 to boost Dutch capacity". Railway Gazette International. London. Archived from the original on 2 September 2009. Retrieved 11 May 2009. ^ "The future of Air Transport in the United Kingdom" (PDF) (Press release). Eurostar. June 2003. Archived from the original (PDF) on 7 October 2011. Retrieved 18 June 2009. ^ "Passports & Visas". Eurostar. Archived from the original on 21 May 2008. Retrieved 15 May 2009. ^ "Eurostar reports signs of recovery, while Brown predicts expansion". Rail News. Stevenage. 15 October 2009. Archived from the original on 18 October 2009. Retrieved 4 November 2009. ^ Smith, Mark (22 October 2009). "Can you love train travel? Yes you can!". The Guardian Travel Blog. London. ^ Odell, Mark (13 May 2012). "Eurostar eyes expansion across Europe" (paywall). Financial Times. London. ^ "Eurostar to add new destinations". 13 June 2012. ^ Topham, Gwyn (16 March 2016). "Wine line: Eurostar mulls direct trains to Bordeaux from London". the Guardian. ^ "La Route Du Soleil". Eurostar. 2012. Archived from the original on 17 December 2012. Retrieved 20 December 2012. ^ "London to Lyon by train - Buy tickets from $63.54 - Loco2". loco2.com. ^ a b "Direct Eurostar to Lyon, Avignon & Marseille - Times, prices, tickets". www.seat61.com. ^ "Eurostar confirms launch of London – Amsterdam services in December 2016". Railway Gazette. 27 September 2013. ^ Barrow, Keith. "Eurostar Amsterdam timetable emerges". ^ "The Man in Seat 61: What's new on the site". www.seat61.com. ^ "Antwerpen mist aansluiting naar Londen - OV-Magazine". www.ovmagazine.nl. ^ "Eurostar plans Easter launch to Amsterdam". ^ a b Smithers, Rebecca (22 February 2018). "Eurostar's direct London-Amsterdam tickets on sale after IT hold-up". the Guardian. ^ "Liberalization of railway transport: European directives on railway transport and Access to infrastructure" (PDF). Enrico Mordiglia. Archived from the original (PDF) on 2 February 2010. Retrieved 11 May 2009. ^ "EU agrees to liberalise rail by 2010". EurActiv.com. Brussels. 29 June 2007. Retrieved 11 May 2009. ^ Milmo, Dan (8 June 2009). "Eurostar faces rivals for cross-channel route". The Guardian. London. ^ "Channel Tunnel working group investigates shorter trains". Railway Gazette International. London. 22 March 2010. Retrieved 27 April 2010. ^ "Trenitalia awards contract for 50 high speed trains". Railway Gazette International. London. 5 August 2010. Grant, John (2008). The green marketing manifesto. John Wiley. ISBN 0-470-72324-6. Penny, Charles (1996). Channel Tunnel Transport System. Thomas Telford. ISBN 0-7277-2515-7. Piggott, Reginald; Thompson, Matt (2012). Mile by Mile London to Paris: the entire railway journey by historic Golden Arrow and modern Eurostar mapped for the interested traveller. London: Aurum. ISBN 9781845137724.